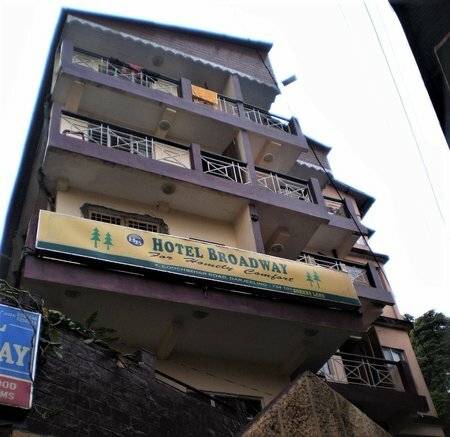 Located conveniently close to the Clock Tower and 5 minutes walk from the Mall, Broadway is a nice mid priced hotel in Darjeeling offering good value for money. I have stayed in the hotel for several nights and dined here as well. I had even tried out different rooms to understand the level of consistency in comfort and amenities offered by the hotel. I was pleasantly surprised that this family run hotel, managed by Amit Khatri meets and even exceeds what it promises. From near the Clock tower where the Gandhi road begins, as you walk few yards, there is a narrow road that goes to the left. This steep uphill road is Cooch Behar road and the hotel is barely 100 yards from where you take the left turn. But this 1 minute walk can be quite cumbersome for the elderly people. However a taxi can come right up to the hotel. But even from the road level, you will need to climb a steep flight of stairs (some 20 steps or so) to reach the reception. If this small exercise is acceptable to you, then rest of the stay is likely to be quite excellent for the money you pay. Hotel Broadway was constructed in the early 1960s. It started with only two rooms and over the years has expanded to have 20 rooms, all elegantly done up and most with wooden finish. As you enter the small reception area, Amit a friendly man and a member of the family owning the hotel is likely to welcome you. In the morning until about 10:30am, his father, another pleasant person usually runs the reception counter. The family stays further up on Zakir Hussain road and on top floor of Hotel Broadway Annex which is also owned by them. There is a small seating area at the reception. While there are couple of rooms at the reception level, most of the rooms are on upper floors. There are three floors above the reception. My first stay was at room no. 5 which is at the first floor. The room walls including the floor and ceiling were completely wooden paneled. When I asked Amit about what kind of wood is that, he said it's Dhupi or locally known as Christmas tree wood. The ceiling was very nicely designed with slanted wooden panels giving a heritage cottage like feel. It had a nice wooden cupboard with good space and lots of hangers. The room had a queen bed. There were double quilts provided and you really don't need any more coverings to keep yourself warm at night. Of course they provide room heaters (blowers or the ones with coils) at an extra charge if you so need. There is a TV with a remote in all rooms. Well I didn't find a remote in the second room where I spent the last few nights. But that didn't really matter for me. TVs work fine with all the standard satellite channels. 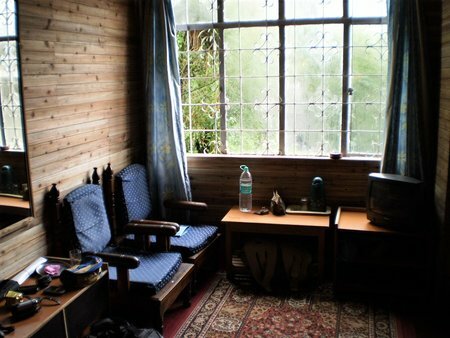 There are couple of cushioned chairs kept in the corner of the room with a low table. This is where you can have your tea and relax. 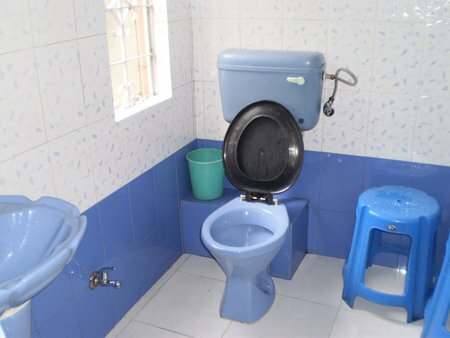 Bathrooms are of western style and moderately well maintained. There is a separate tap for hot water. However like all other budget hotels in Darjeeling, the geyser works for 3 hours in the morning (6-9am). On request, they switch on the geyser even at other time. So there is no real issue here with hot water. The only thing you wish is that the hot water was also available at the wash basin. You will need to use a bucket and a mug to get around the problem. Some rooms in the front have balconies. Out of them few have private balconies and the others have shared ones. And few select rooms have nice views of the mountain range. From most of the other rooms, there is not much view. I could however see the Cooch Behar road next to my room. In the morning I used to often wake up with the noise of the school children coming down the road or by that of a passing milk van. Otherwise being a little off the main road, there is not much noise to disturb you. No, there is actually another source of noise. At around 3:30am, you are likely to wake by big noise of doors shutting in the other rooms. Then you know that your fellow guests are heading for Tiger Hill to see the sunrise. My experience with the second room (#6) was also similar. It had a bigger space. But strangely there was no cupboard. So I had to keep all my stuff on the chair or the floor. However these are standard rooms that are offered for double or single occupancy. The family rooms are much larger and can accommodate up to four persons with extra beds. In several occasions I had taken my breakfast and other meals in the room. To my pleasant surprise, I found that the room service in the hotel is really nice. Someone would have given some good training to the waiters about sense of timing. When I asked for my breakfast at 8am, it came exactly at 8. Most waiters seem to be Bengalis. They may not look professional by their appearance, however did the job quite nicely. The restaurant is located at the reception level and just before the staircase that leads to upper floors. Although it looks simple, the food served is quite nice and comes in good portions. It serves mainly Indian and Chinese dishes. I personally like the non-veg chicken thali which comes with steaming rice, five chapatis (or tawa rotis), good portion of chicken, a vegetable curry or sabji, papad and salad. I must say that the price is quite reasonable. Another favorite of mine here is the khichri (prepared with rice and pulses) with fried fish. The khichri prepared in Bengali style is delicious - it was optimally prepared, not too dry neither too watery. 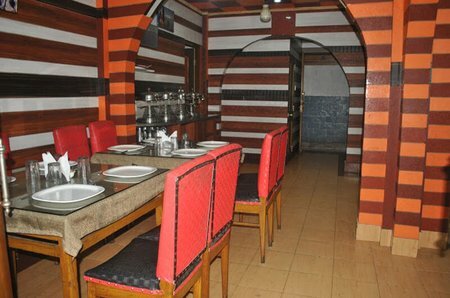 This is one of the few restaurants in Darjeeling which prepares Bengali dishes including fish curry. However, you will need to order them in advance. Amit mentioned that Khichri and fried fish at the Broadway is a top favorite of Anjan Dutta, a well known Bengali musician and film director, who did his schooling here and keeps coming back to the hill town. 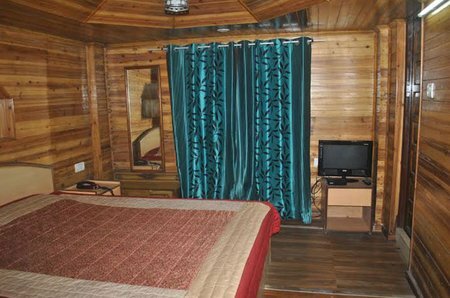 Many tour operators from Kolkata who bring groups of Bengalis to Darjeeling, prefer this hotel for its location, nice room amenities and the food. They run a generator when the power goes off. It supports a small tube light in the room which is good enough to keep the room illuminated. However if the power goes off after 10pm at night, you will need to light candles that are provided in the rooms. So using toilets late at night can be a problem unless you carry a torch. Hotel Broadway is located right next to the BSNL Telephone Exchange building on Cooch Behar Road. From the Clock Tower, it's 1 minute walking distance. You will need to take a sharp left turn from Gandhi road and walk uphill for some 100 yards or so. The Chowrasta Mall is some 5-6 minutes walk from Broadway Hotel. 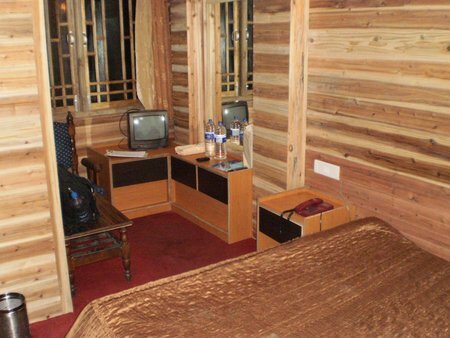 1) Check out Darjeeling Top Mid Priced Hotels for the best cheap hotels in Darjeeling. Stayed in Hotel Broadway, Darjeeling with my wife from 15th January, 2017 to 18th January, 2017. While having a conversation on booking the hotel with Mr. Amit Khatri (owner of the hotel) I clearly mentioned good view room, attached bathroom, Heating arrangement, hot & cold water supply, close to Mall, accessible by taxi and taxi stand near by and to my surprise all the commitment made by him prior booking the hotel were 100% kept. I am totally satisfied with the hotel facility and the room. I stayed at room number 16 which is at the top floor, and trust me readers if you want to book hotel Broadway you can specifically ask for this room and you will not be dis satisfied. If you find the room is booked then you can ask for room number 19 that is equally good.